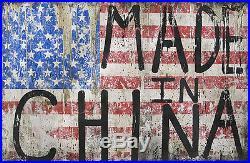 Made in China by Greg Haberny is a hand finished, signed, limited edition silkscreen of 50. As such each print is unique. To create it, Greg Haberny used a silkscreen print as a base on which to'layer on' in order to create a unique built up effect. Due to the heaviness of the print, Greg has signed and numbered this work on the back. The size of this amazing silkscreen print is 60 x 102 cms. All prints have been carefully stored flat and, as such, are not framed. This unique print will be sent out flat via UPS in order that it arrives with you in perfect condition. If you would like to see more then do please visit my shop. The item "Made In China by Greg Haberny Signed, Hand Finished Ltd Edit Silkscreen of 50" is in sale since Friday, October 21, 2016. This item is in the category "Art\Art Prints". The seller is "epicurean11" and is located in Brentford.